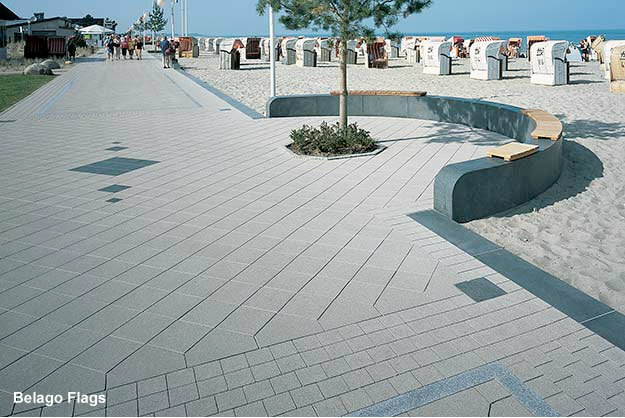 Commercial Paving – We can offer a wide range of commercial paving products from our German manufacturer Hansebeton-STEIN. 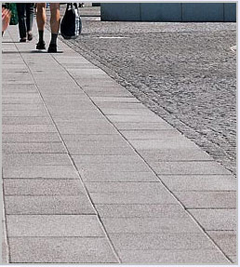 There is a substantial choice of finishes, colours, and sizes, to meet the requirements of modern street scene design. Product sizes range from 10x10cm to 60x40cm, and thicknesses from 4cm to 10cm. A large number of our commercial products can also be manufactured with the unique Hanseclean<sup>®</sup> system. Due to the number of finish, colour and size variations, these products are only available via specification on a project by project basis. Please contact us with any specific requirements. Single layered with spacer lugs and broken edges as well as artificially aged finish. Complies with DIN EN 1338. Available in a wide range of colours and textures.